In the preparation it was recognised that whilst there are numerous clauses which will be generally applicable there are some provisions which must necessarily vary to take account of the circumstances and locality in which the Services are to be performed. The clauses of general application are under General Conditions. 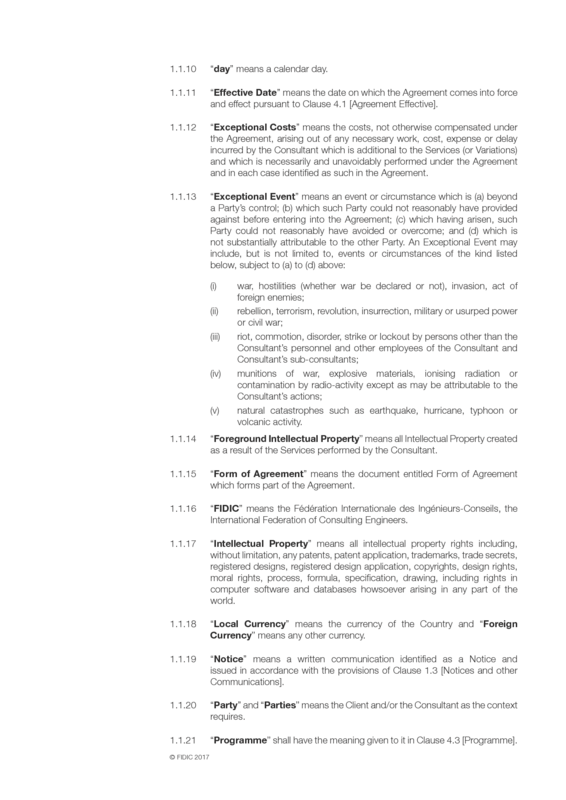 They are intended for incorporation as printed in the documents comprising the Agreement. 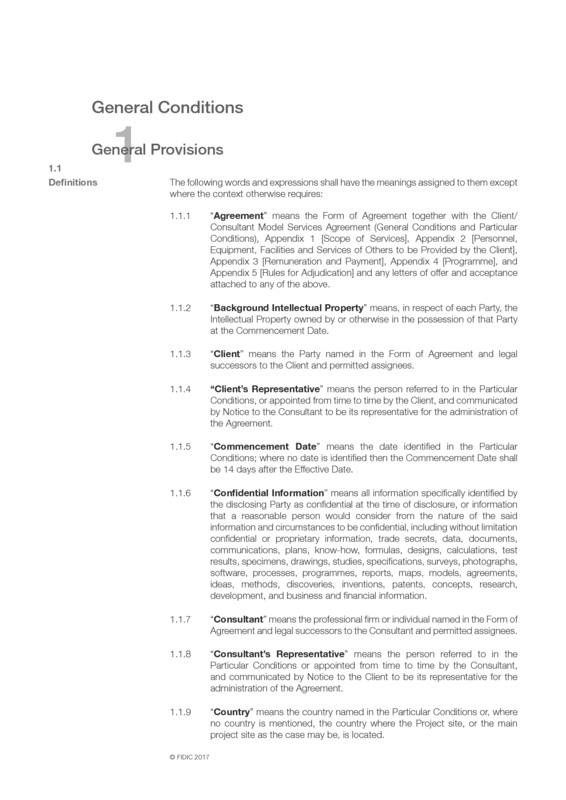 The General Conditions are linked with the Particular Conditions by the corresponding numbering of the clauses so that the General Conditions and Particular Conditions together comprise the conditions governing the rights and obligations of the parties. The Particular Conditions must be specially drafted to suit each individual Agreement and type of Service. 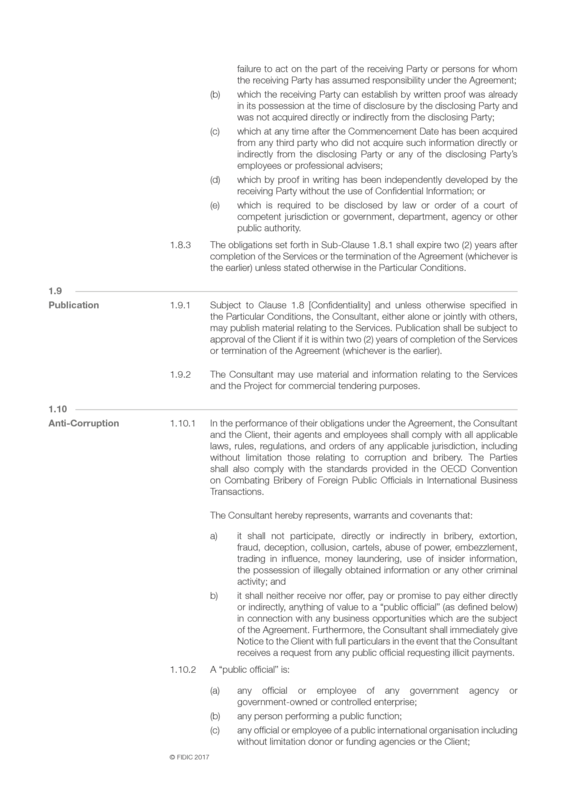 References to the General Conditions are in Part A whilst any amendments to the General Conditions or additional clauses are in Part B. 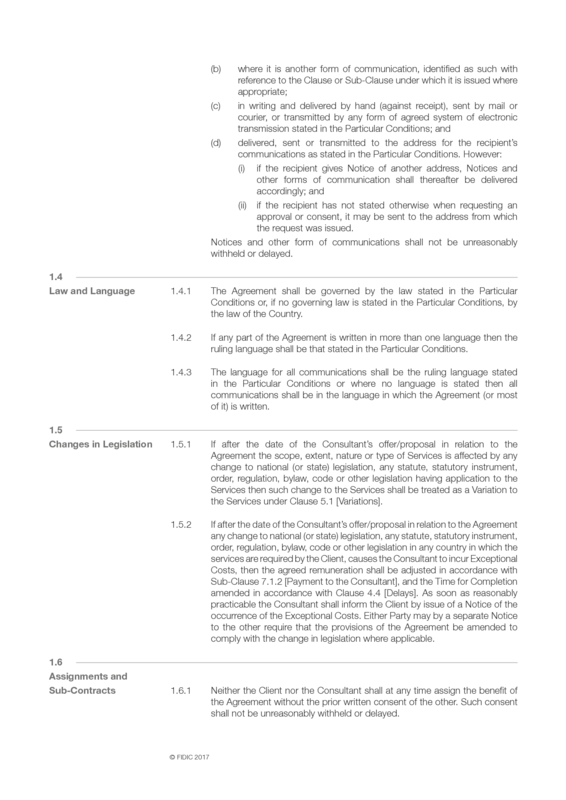 These pages must be completed for incorporation into the Agreement. FIDIC intends to publish an updated "White Book Guide" which will include comment on the clauses in the White Book and guidance on completion of the Appendices. Compilers of the White Book in the meantime can refer to various other FIDIC publications available in the Bookshop of FIDIC’s website at www.fidic.org. 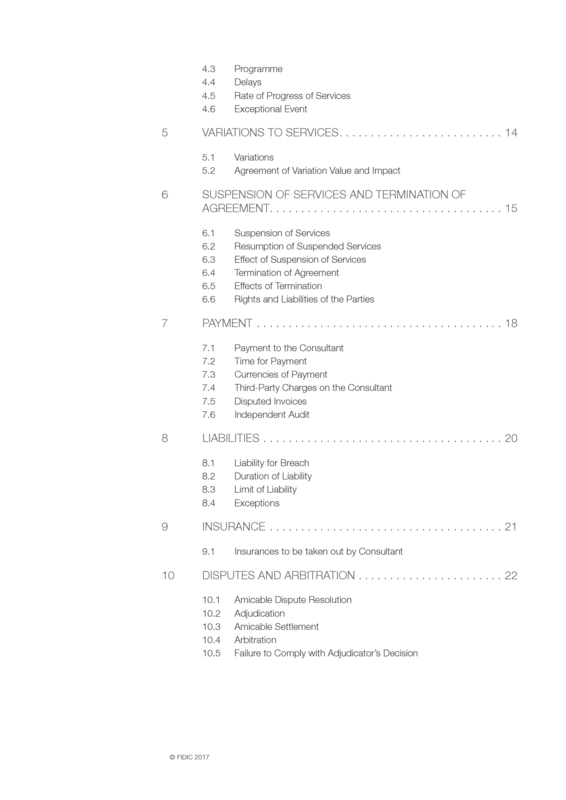 Compilers of scope of work in Appendix 1 may wish to consult the FIDIC Definition of Services guide. The Task Group recognised considerable pressure from some parts of the industry to enhance the obligations placed on the Consultant to ensure that the professional services and deliverables would be fit for purpose. The problem confronting the Task Group is that there is no common understanding of due skill and care or fitness for purpose either between clients and consultants or between legal advisors in various jurisdictions notwithstanding the wide usage of such terms.  In looking at this problem the Task Group accepted that the Client is entitled to expect that the professional services will be completed correctly and that all the specific contractual requirements will be met, and that if they are not correct, or any requirement has not been fulfilled, then the Client should be entitled to appropriate redress against the Consultant. This approach assumes that the Consultant is fully experienced and competent in the delivery of the relevant services and accordingly an appropriate stipulation has been added to the new White Book. In assessing a fair balance of risk between the Client and the Consultant the Task Group considered the position where the services were rendered defective or inadequate for reasons beyond the Consultant’s control or knowledge. It is well known in the industry that Consultant’s cover their liability under contract by taking out professional indemnity insurance. The Task Group, and the FIDIC CC, is satisfied that professional indemnity insurance policies do not cover liability for defective or inadequate services without evidence of fault or breach on the part of the Consultant. Such insurance only covers liability where there is a failure on the part of the Consultant to use reasonable skill and care to be expected from an experienced consultant. The Task Group also examined whether the normal obligation placed on Consultants to use reasonable skill and care in delivering the services was an industry standard. The Task Group examined over 20 standard forms of appointment for consultants worldwide and noted that none of these forms of appointment required professional services to be fit for purpose or imposed strict liability for defects. The standard, whether expressed or implied, was reasonable skill and care. Accordingly, the Task Group determined that it was not a fair or reasonable balance of risk to make the Consultant strictly liable for the outcome of the professional services in situations where there was no evidence of fault or breach on its behalf. The Task Group noted that in certain civil law jurisdictions strict liability for defective services was imposed on the Consultant – in some jurisdictions relief was available for matters that were not within the Consultant’s control whereas in others no relief was available. The Task Group acknowledged, that in a limited number of countries, provision of insurance to cover strict liability was a mandatory obligation placed on the insurance market, however this approach is not followed generally and cannot be taken to reflect the international position. The Task Group and FIDIC CC determined therefore that the appropriate standard of care to be imposed on a Consultant was that of reasonable skill and care to be expected from an experienced consultant. 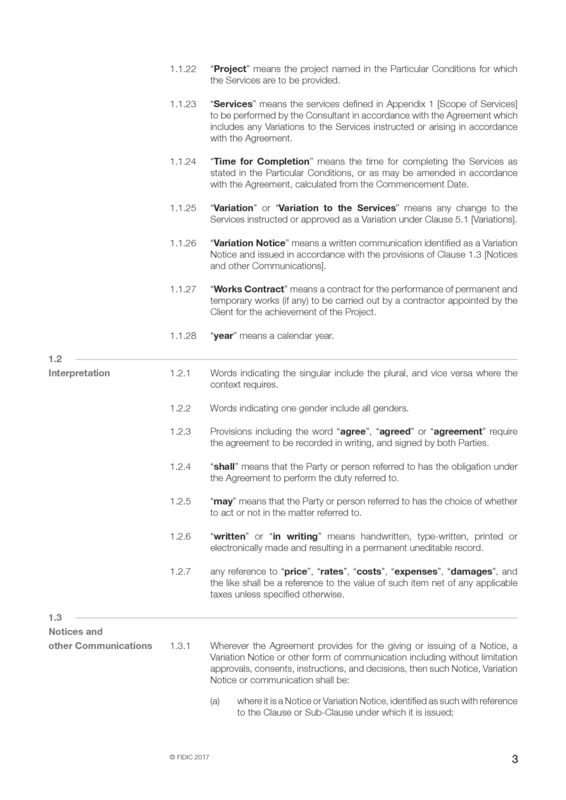 The Fifth Edition has enhanced the Consultant’s obligation to the reasonable skill and care to be expected from a consultant experienced in the provision of services for projects of similar size and complexity and further, but without extending this obligation, the services must satisfy the function and purpose described in the Agreement. This obligation will not make the Consultant liable for defective or inadequate services arising out of unforeseeable or uncontrollable events and therefore, the obligation should be fully insured under any professional indemnity insurance policy. This is to the benefit of both the Client and the Consultant and represents the correct balance of risk between the two parties. This Client/Consultant Model Services Agreement represents the basic form of a Contract of Appointment between a Client and its Consultant. It is intended to cover the minimum requirements of a typical appointment contract. 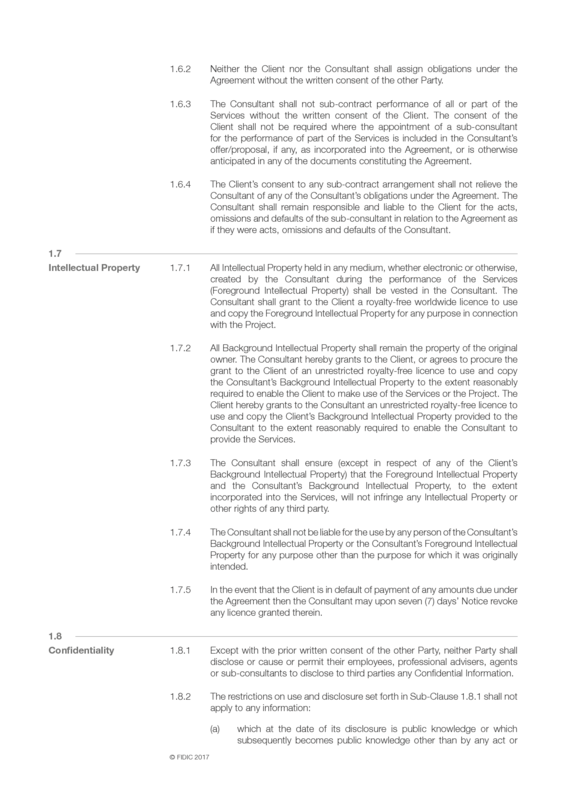 Additional or amended clauses may be required in the Particular Conditions to address particular project and commercial issues between the parties. Where other material is to be incorporated into a Contract of Appointment, care must be taken to ensure consistency both in the use of terminology and the allocation of duties and obligations. The parties to the contract may wish to take independent legal advice in connection with the preparation of this agreement. Independent legal advice may also help the parties understand their legal liabilities, duties and obligations arising under the Model Services Agreement. Neither FIDIC nor any committee or individual connected with FIDIC can be held liable for project or commercial losses suffered as a result of adopting the Client/Consultant Model Services Agreement as the basis of a contractual arrangement. 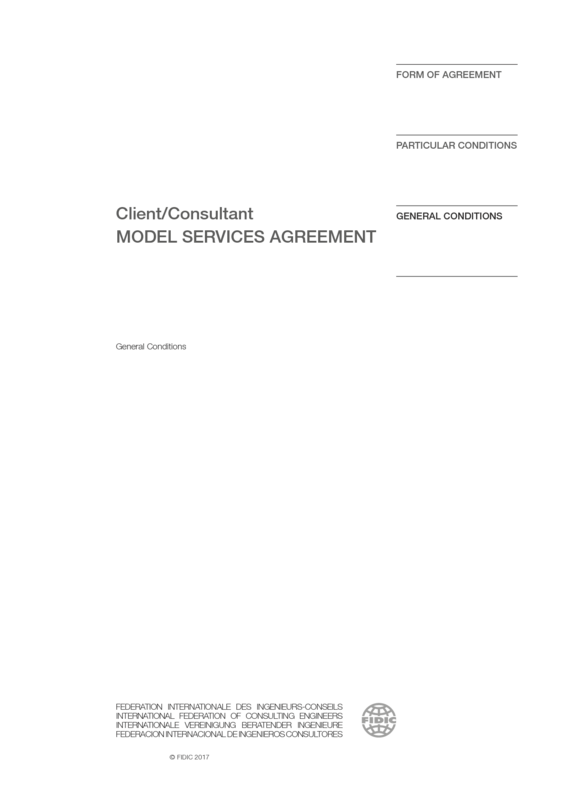 Client-Consultant Model Services Agreement (White Book) 3rd Ed, 1998. 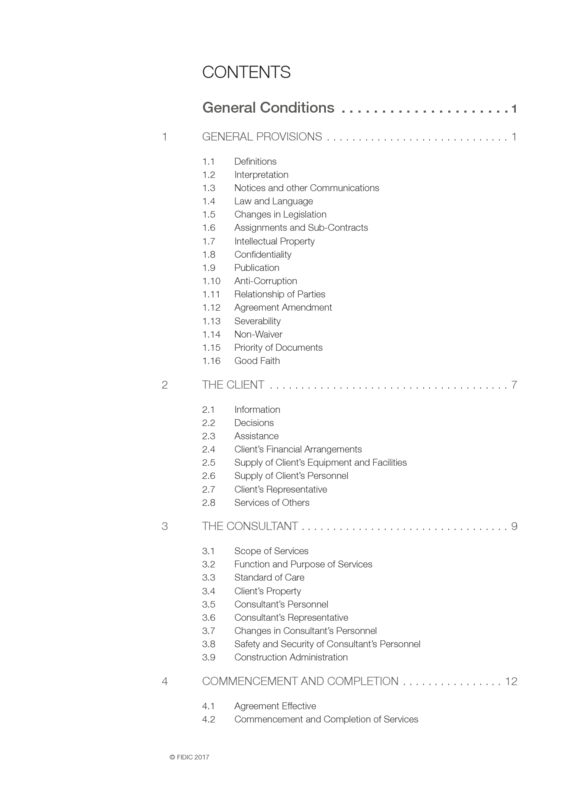 Client-Consultant Model Services Agreement (White Book) 2nd Ed, 1991.